Veteran activists Abdul Muhammad and Salaam Ismial, the co-chair of the New Jersey Study Commission on Violence, held a press conference on the steps of Newark’s City Hall to discuss how Newarkers could come together as a community and address the violence that has affected all of us. Just a slight mention of criticism toward Mayor Baraka may very well get you assaulted. In the press conference, Mr. Muhammad called out the Mayor for being silent while our city experienced 105 homicides in 2015. Mr. Muhammad also suggested that Newark residents needed a clearer plan from our Mayor to combat the violence that has paralyzed residents. Regardless of our politics, given the increase in car jackings, shootings and murders, suggesting a need for a plan seems fair. Our community has had enough, 105 homicides this year–up 8 percent from last year. Thousands of you listen weekly to our Internet radio show – Real Talk Radio – and many have expressed concerns. It seems the only time the press reports on Newark is to document another violent car jacking or killing and posts of concern dominate social media platforms. For many living in Newark there is a fear and concern among neighbors, especially women and Senior Citizens. We all agree that this is a very dangerous time to live in Newark – and certainly the experience and insights of Mr. Muhammad and Mr. Ismial on this issue should be respected. Unfortunately, the very suggestion, by Mr. Muhammad, that our Mayor Baraka should hold some responsibility on this issue was cause enough for one Baraka supporter to disrupt the press conference and for another to put Mr. Muhammad in a chokehold. This scene created an embarrassment for the entire City and was reported nationally. I refuse to take anymore time detailing the press conference. It was fully reported by various news organization and some incredibly disturbing photos and videos have made their way around social media. The Baraka supporter who put Mr. Muhammad in a chokehold holds a salaried position appointed by Mayor Baraka. According to the Newark Community Street Team’s web site, where this man works, “Mayor Ras Baraka entrusted” this person with the responsibility to direct the project for the City of Newark. How were you notified about this press conference? Do you normally have an interest in attending press conferences? Did anyone associated with the Mayor or the Mayor himself “suggest that you attend the press conference? Did anyone associated with the Mayor or the Mayor himself “suggest” you cause a disruption at the press conference? Has the Mayor reprimanded you in any way? As a benefactor of Mayor Baraka’s appointment have you ever felt pressure to participate in activities that go beyond your role? For a blog dedicated to education, let us spell out why these questions need answers. For those parents, who play by the rules, but disagree with the Mayor on education a new level of intimidation in our city is developing. And if you disagree with the Mayor, if you share your voice publicly, you too could face intimidation tactics. 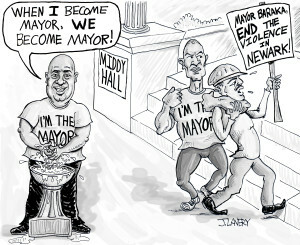 As a candidate for Mayor, Ras Baraka stated, “When I become Mayor, we become Mayor” but it seems that the only ones who’ve become Mayor are those who follow Mayor Ras J. Baraka.